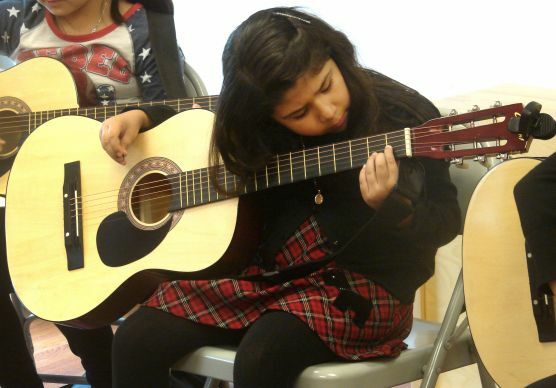 Isabella Barco, 7, practices a D chord in guitar class at Christ’s Foundry United Methodist Church in Dallas. Christ’s Foundry United Methodist is a small, low-income Hispanic church with more guitars than the Grand Ole Opry. At Christ’s Foundry, any child who learns to play “Amazing Grace” on a loaner guitar gets to keep that guitar. The church offers guitar classes on Sunday afternoon, each session beginning with Bible study. On Mother’s Day, May 11 — after 14 weeks of classes — the children will perform that hymn and two others, and make the instruments theirs. “Amazing grace, how sweet the sound” isn’t necessarily the case with beginning guitarists. The sound can approach cacophony. But sweetness comes in the sight of children grappling with instruments about as big as they are, and in teenage teachers — graduates themselves of the “Amazing Grace” course — demonstrating basic chords and strumming patterns. Beginning guitar isn’t the only music class offered at Christ’s Foundry. Children and youth can take advanced guitar, bass guitar, keyboards and drums. “To take any of the other classes, you must first pass through `Amazing Grace’ beginner’s guitar,’” said the Rev. Owen Ross, Christ’s Foundry’s pastor. The story of how the church came to have so much music instruction — involving 50 children and youth this term — is rather amazing itself. The story begins with Ross. Ross is an East Texan and a graduate of Texas A&M University and Southern Methodist University’s Perkins School of Theology. He recently completed requirements for a doctor of ministry degree from Asbury Theological School. He became fluent in Spanish years ago, while teaching swine management in Ecuador for the Peace Corps. In 2002, the North Texas Annual (regional) Conference appointed Ross to plant a church in the poor, heavily Hispanic area near Dallas’ Bachman Lake. He moved into the neighborhood, and Christ’s Foundry held its first service on Ash Wednesday 2003 in his small home. Music was crucial from the beginning. Ross and his first intern, Rosario Quinones, would play accordion and keyboard in leading the worshippers in hymns and praise songs. As the congregation grew, it moved to a couple of vacant apartments. Conference churches and individuals helped Christ’s Foundry raise $2.5 million to build its own building, which was dedicated in 2012. The congregation currently averages 180 in both Spanish and dual-language Sunday worship, and its social services reach some 2,000 constituents. Ross already had taught a couple of the Christ’s Foundry youth the basics of playing guitar and other instruments — enough to join him in leading worship. “We needed more guitar players,” he said. Ross contacted Noteworthy Ministries, but learned from its founder and director, Wayne Johnson, that no funds were available to bring guitars to Christ’s Foundry. First, Ross attended a training event in which a pastor ambushed him with the question, “Who are you personally discipling?” Ross didn’t have a good answer. Second, a Christ’s Foundry member, Adriana Campos, came to Ross, tearfully saying, “We’re losing our kids.” She urged him to find new church-based activities to keep her children and others from drugs and other dangers of the neighborhood. Ross recalled the visit Johnson made to that first group. Johnson remembers that first visit too, when the church still met in the apartment complex. Ross eventually formed a complete youth praise band from the early graduates of that program. The band now helps lead worship services every Sunday. Some of the kids stuck with guitar, but others moved on to keyboards, bass guitar and drums. Ross cheerfully acknowledges that the youth are overtaking him. He points to Raymundo Campos, a standout drummer in the youth band, and to Manuel Campos, who plays electric guitar. Some 80 children and youth have earned guitars at Christ’s Foundry. Noteworthy Ministries is on operational hiatus, but Ross has been able to continue “Amazing Grace” classes, as well as classes for advanced guitar, bass guitar and drums, thanks to a grant from Dallas-based ORIX Foundation. “Our board members conducted a site visit and were impressed with the engagement of both the staff and students and felt privileged to have played a part in assisting these children,” said Carol Greene, the foundation’s director. The “Amazing Grace” beginner’s guitar class, open to kids 7 and up, goes for 13 weeks. Tuition is $40, but the graduation award of a guitar, case and tuner represents a $150 value. Other classes are $10. Classes are open to all children of the community — not just Christ’s Foundry members. These days, Ross gives an occasional ad hoc music lesson, but overall supervision of the program falls to Amy Spaur, associate pastor and music worship leader. The youth band members teach the classes, earning just above minimum wage. “I don’t just teach kids about music. I teach them about God and to play for God,” said Berenice Baeza, 18, a high school senior who plays keyboard in the youth band on Sunday morning, teaches keyboards on Sunday afternoon and hopes to attend McMurry University, a United Methodist-related school in Abilene, Texas. In March and early April, the beginning guitarists focused on two-chord songs that they played during Easter Sunday worship. Then came the three-chord mountain of “Amazing Grace.” It’s to be the climax of their Mother’s Day’s concert, and they’ll sing as they strum. Meanwhile, the better students from recent classes have been playing together on guitar, bass guitar, keyboards and drums, in a junior varsity ensemble that will eventually get a shot at helping lead worship services. “We’re calling it the Next Generation Band,” Ross said.